Our range of products include gouy's method, g.m. 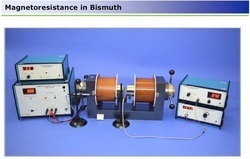 counter digital, measurement of susceptibility of solids by gouy's method, magnetoresistance in bismuth measurement instrument, stefan constant kit and frank-hertz experiment instruments. Load Regulation: ±0.1% for load variation from 0 to max. Protection: Protected against overload, short circuit and transients caused by the load inductance. GIGGER MULLER COUNTER (G.M.COUNTER) A general purpose Instrument for measuring suitable for radioactivity counting utilizing Geiger-Muller-Tubes or solid state Radiation particle detectors and as a general purpose millisecond digital timing device with manual setting and electronic display. The bright L.E.D has six digits, 14mm high, making it suitable for individual use or class demonstration. In the radioactivity an integral pre-amplifier is provided for solid state detectors and an adjustable 300 to 1200V E.H.T supply for G.M tubes. In the timing , the display reads in seconds, i.e from 0 up to 99.9s, and provided front panel thumbwheel setting. Consist of following items. :- G.M.COUNTER: COMPLETE WITH INBUILT POWER SUPPLY EHT 250-1200v Workable on 220v. 50Hz., Power consumption 8W approx. STOP, START, RESET switches. Counts Capacity : 6 DIGIT COUNTING SYSTEM, Preset time : 3 DIGIT PROGRAMABLE TIMER WITH DIGITAL DISPLAY. 3 ½ Inbuilt Digital Volt Meter for GM TUBE Voltage. G.M.TUBE: END WINDOW G.M.TUBE MOUNTED IN ACRYLIC STAND. WITH ‘LEAD’ AND ‘ALUMINIMUM’ ABSORBENTS, Radioactive Source: ONE RADIOACTIVE SOURCE BETA or GAMMA (in Lead Container and wooden Box) SOURCE, . Dimensions : 460X370X230mm. 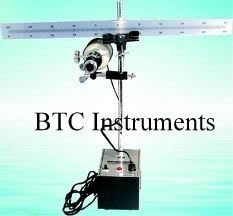 (Complete instrument is HOUSED in corrugate box with Export Packaging) Wight : Total weight of the Instrument is 5.5kg. Objective : Stefan’s Constant apparatus has been designed to study the Stefan’s law of radiation. Features : Continuously variable, over load & short circuit protected DC regulated power supply of 0 to 20V. 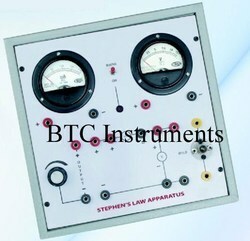 Voltmeter & Current meter are mounted on the front panel to measure the voltage & current. Bulb holder with bulbs 19 Volt is mounted on the front panel. All the power supplies are highly stabilised and output voltages can be read on 31/2 digit, 7 segment LED DPM with autopolarity and decimal indication through a selector switch. Power : 220V±10% mains, 50Hz. The instrument can, not only lead to a plot of the amplitude spectrum curve by means of point by point measurement, but also directly display the amplitude spectrum curve on the oscilloscope screen. This instrument can thus be used as a classroom experiment as well as for demonstration to a group of students. 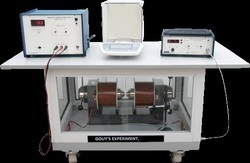 The instrument is basically designed for postgraduate laboratories keeping in view their requirements and limitations. The observation of ESR at low magnetic fields and consequently in radio-frequency region makes its instrumentation and working a lot simple and within the reach of a postgraduate students. Good resonance peaks can be obtained as a class room exercise. The spectrometer is complete in all respects including a sample DPPH (except a CRO). SetupA battery operated laser mounted on a stand is put at one end ofan optical bench. The slide is mounted on another stand (Figure 1)which is kept at about 10 20 cm away from the laser such that thelaser light falls normally on the slide. The slide on this stand can bemoved sideways and vertically so that the laser light falls ondifferent portions of the slide. The diffraction pattern is observed ona perspex screen (Figure 2) fixed normal to the laser light at theother end of the optical bench. The whole set-up is put in adarkened room where the experiment is performed. We are engaged in offering excellent quality Lamp And Scale Arrangement (Main) to our valuable clients. 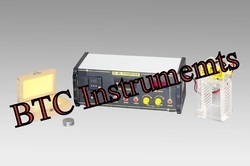 Suitable for use with Reflecting Galvanometer with rack pinion arrangement workable on 220 volts A.c./D.C complete with scale attachment plug and cord. 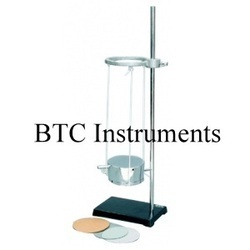 Clients can avail this Lamp And Scale Arrangement (Main) at industry leading prices from us. Lee & Charlton's for determination of the thermal conductivity of bad conductor.Cylinderical metal slab nickel-plated 110mm.diameter, 12mm thick, on this resets a steam chest made of brass nickel-plated 50mm height same diameter fitted with riffled inlet and outlet tubes.Both are having radial holes for insertion of thermometers.Apparatus is suspended by strings attached to lower slab on retort stand with rectangular metal base. Complete with one each disc specimens of glass and ebonite annulus for determining the conductivity of liquids. Without thermometers. Looking for MSC Lab Instruments ?